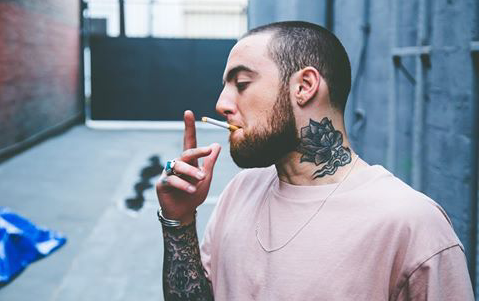 Malcolm James McCormick, professionally known as Mac Miller was an American rapper, singer, and record producer. He was born in January 19, 1992 in Pittsburgh, Pennsylvania. 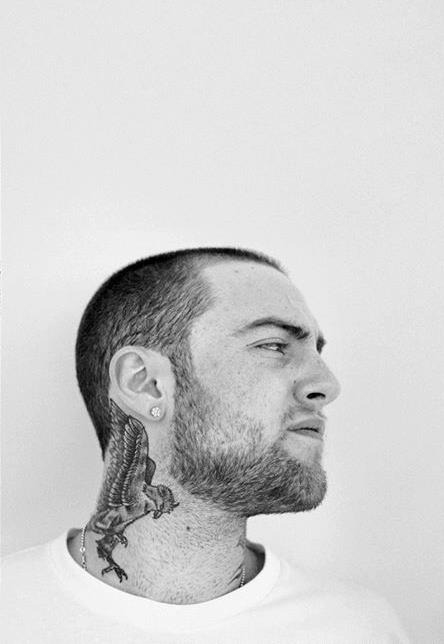 Miller began his career in the city’s hip-hop scene in 2007, at the age of fifteen. 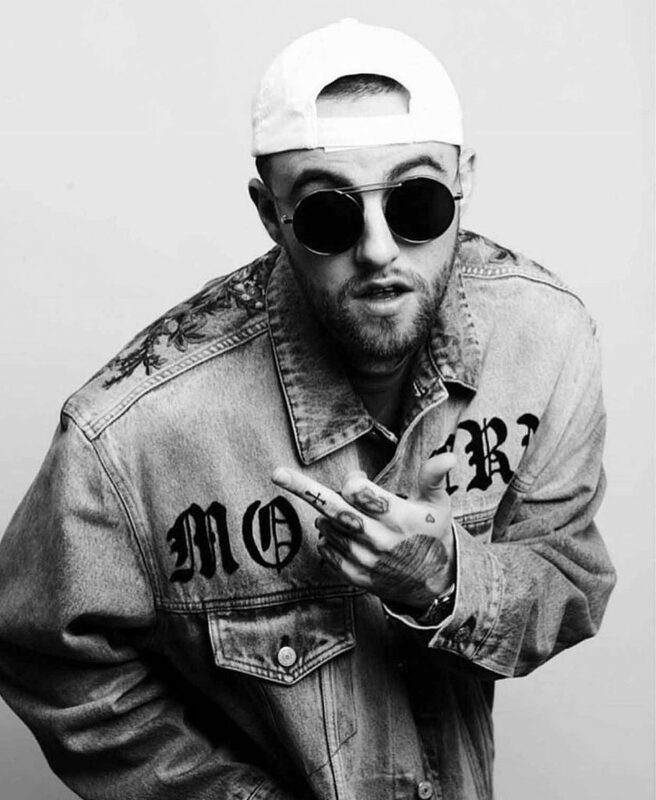 He signed a record deal with Pittsburgh-based indie label Rostrum Records in 2010. His breakthrough came with the mixtapes K.I.D.S. (2010) and Best Day Ever (2011), including the single “Donald Trump”. 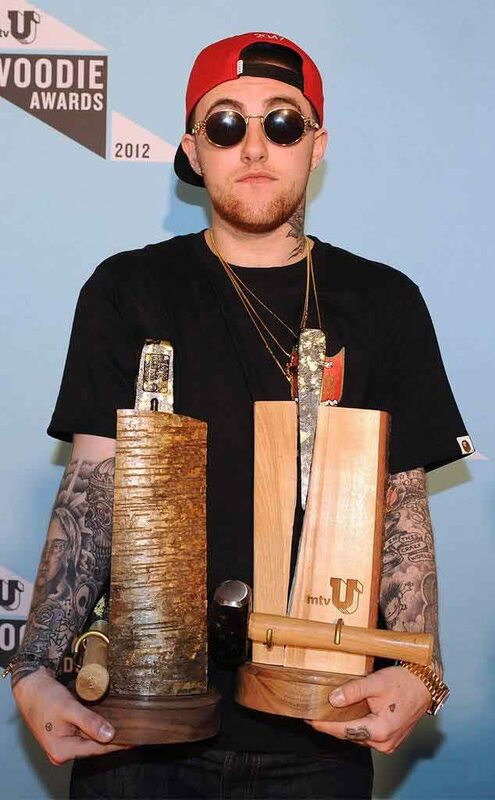 Miller’s debut studio album “Blue Slide Park” (2011) reached number-one on the US Billboard 200, the first independently distributed debut album to top the chart since 1995. 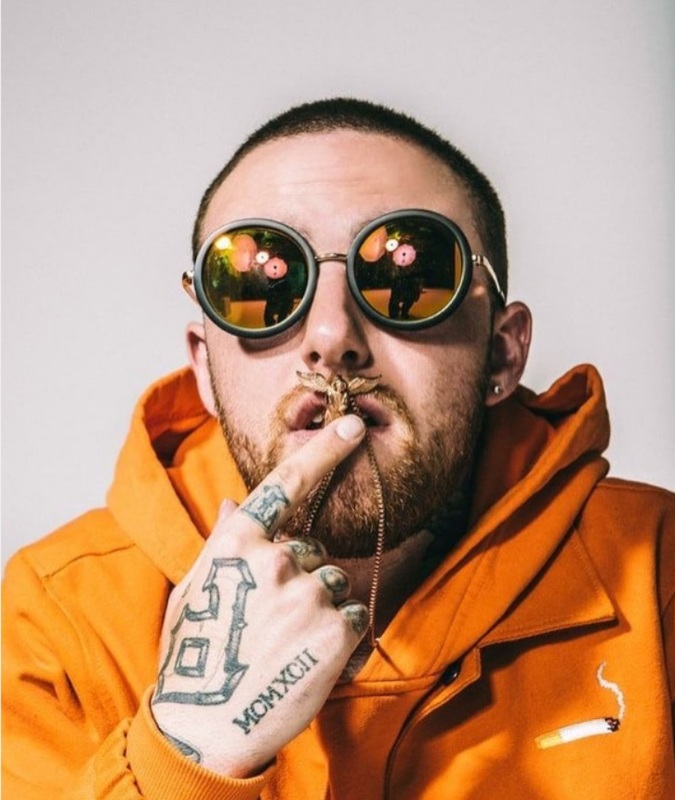 Miller signed a record deal with Warner Bros. Records in October 2014 and released three studio albums: GO:OD AM (2015), The Divine Feminine (2016), and Swimming (2018). 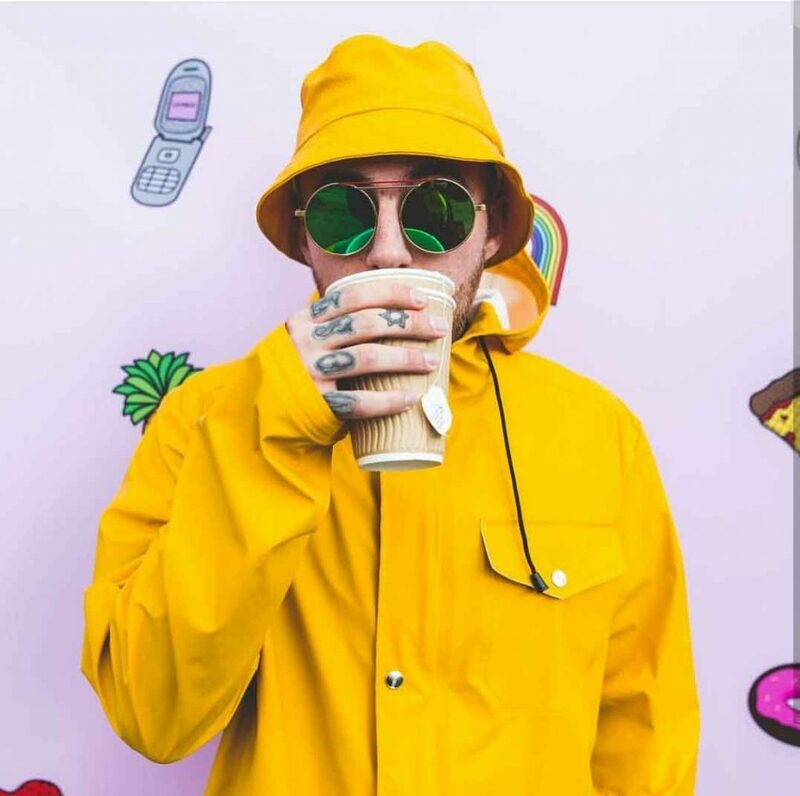 He also served as a record producer under the pseudonym Larry Fisherman, producing music for SZA, Vince Staples, Lil B, Ab-Soul, Riff Raff, Smoke DZA, and himself. 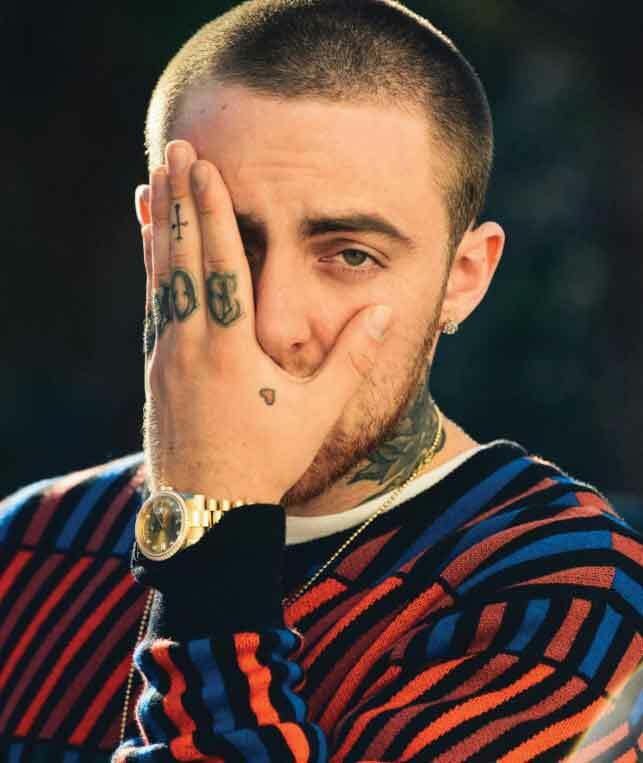 He is posthumously nominated for Best Rap Album at the 61st Annual Grammy Awards for Swimming. 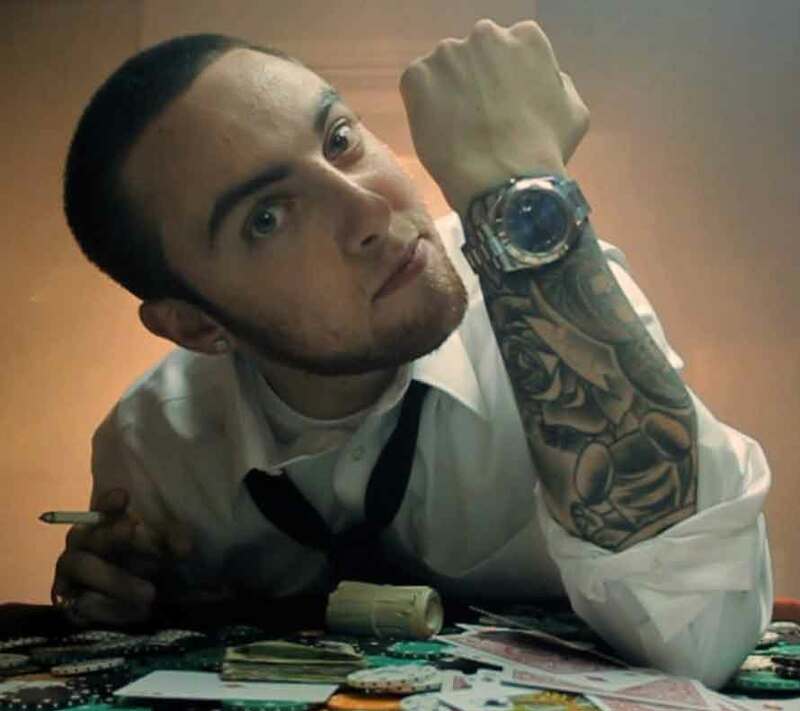 Miller struggled with substance abuse, which was often referenced in his lyrics. 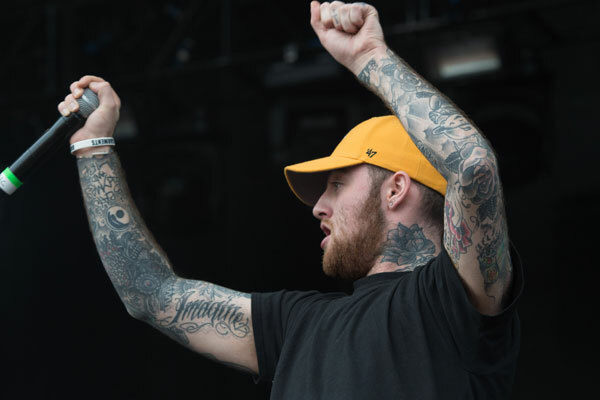 He was found dead of a drug overdose in September 2018, at his home in Los Angeles. Miller had quite a collection of tattoos but he never had a face tattoo. 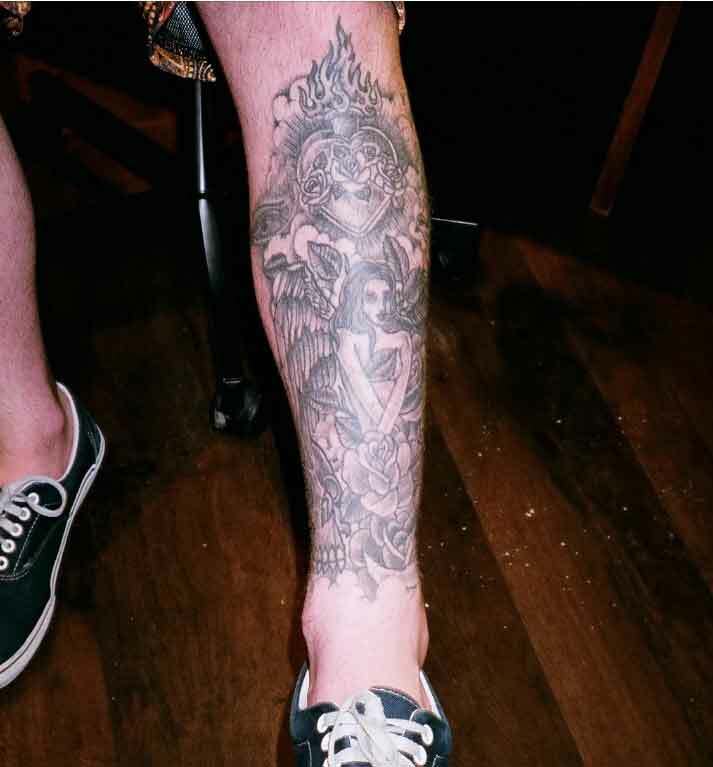 He dedicated a full leg just for stupid tattoos. Miller didn’t have any regretful tattoo, the only thing he regretted that he didn’t have enough space on his body to get more tattoos. He joked about being on the Guinness book of records for the most tattooed man. 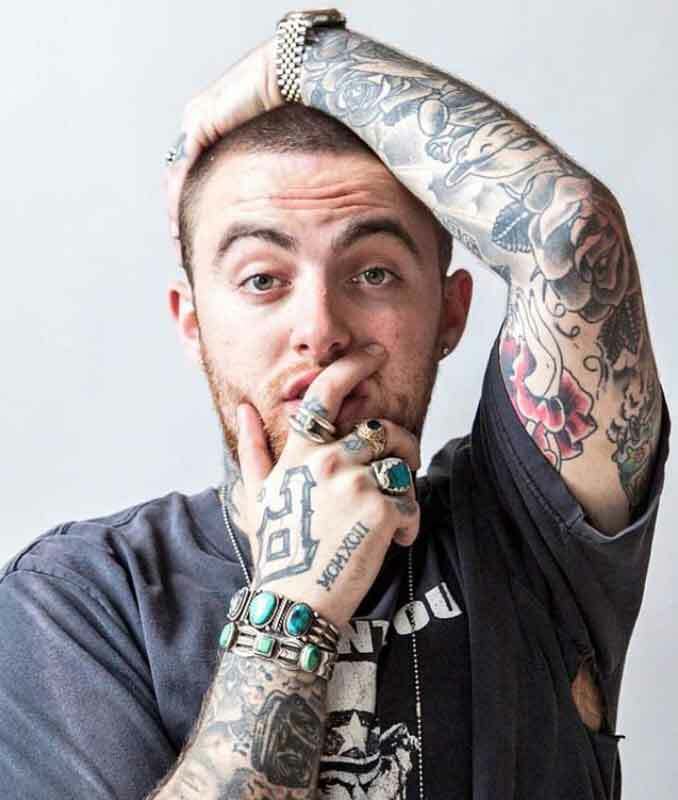 Miller told in an interview that “Sometimes, with tattooing, people get too lost in the meaning. I’m more of a remember-the-moment type of person.” That sums up Miller’s love for tattoos. 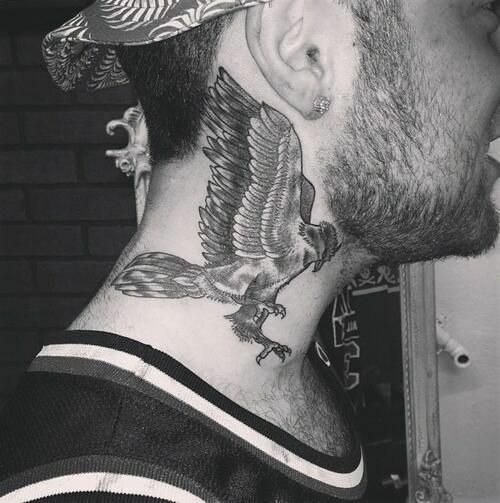 Miller had a Flower tattoo on the left side of his neck. He also had a Hawk tattoo on the right side of his neck. 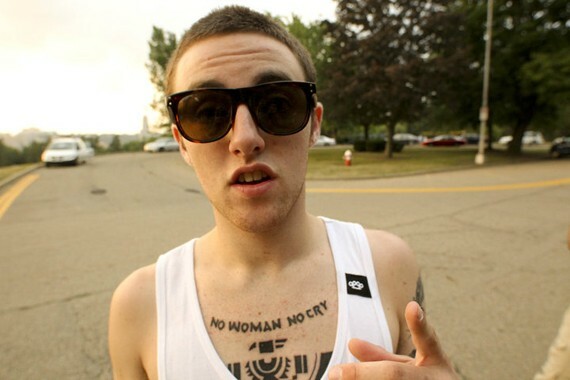 On his chest Miller had “NO WOMAN NO CRY” tattoo which is a famous Bob Marley song. 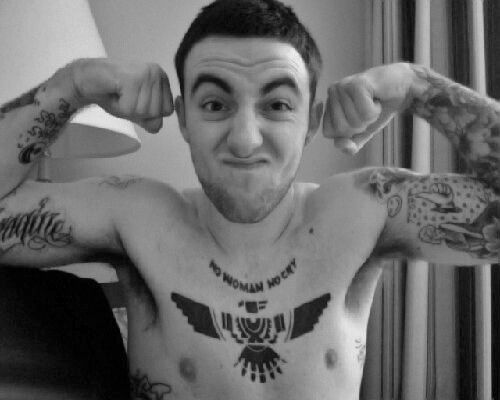 Miller also had a Tribal eagle tattoo on his chest right under “NO WOMAN NO CRY” tattoo. 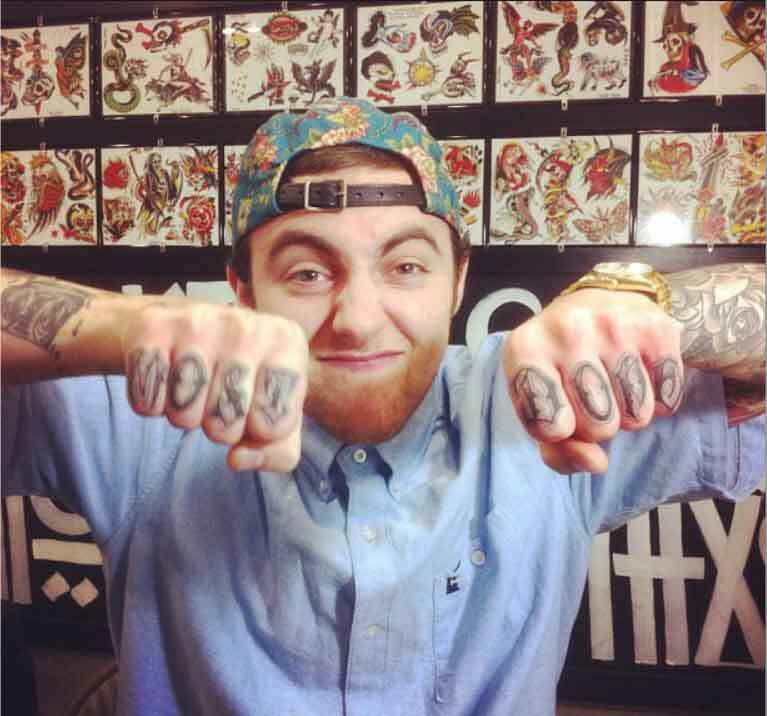 Miller got “MOST DOPE” tattooed on his right rib cage in large fonts and two masks replacing the letter “O”. His left rib cage tattoo reads “RAIN OR SHINE”. Miller got “WE ARE CONFUSED” tattooed on his stomach in cursive font. The tattoo artist sketched the letters freehand on him without using stencils. 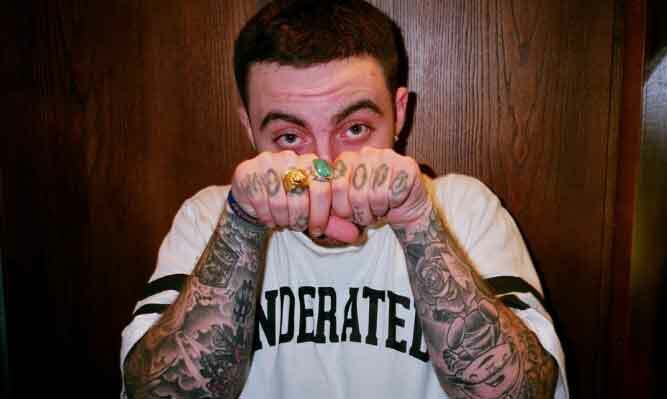 Miller had his birth year 1992 tattooed in Roman numeral “MCMXCII” on his right hand. He had a Pittsburgh Pirates “P” logo tattooed on his right hand. Miller had a beautiful Sunset tattoo on the back of his left hand. A tiny Peace sign tattoo on the back of his right hand. And a tiny Heart tattoo on the back of his left hand. 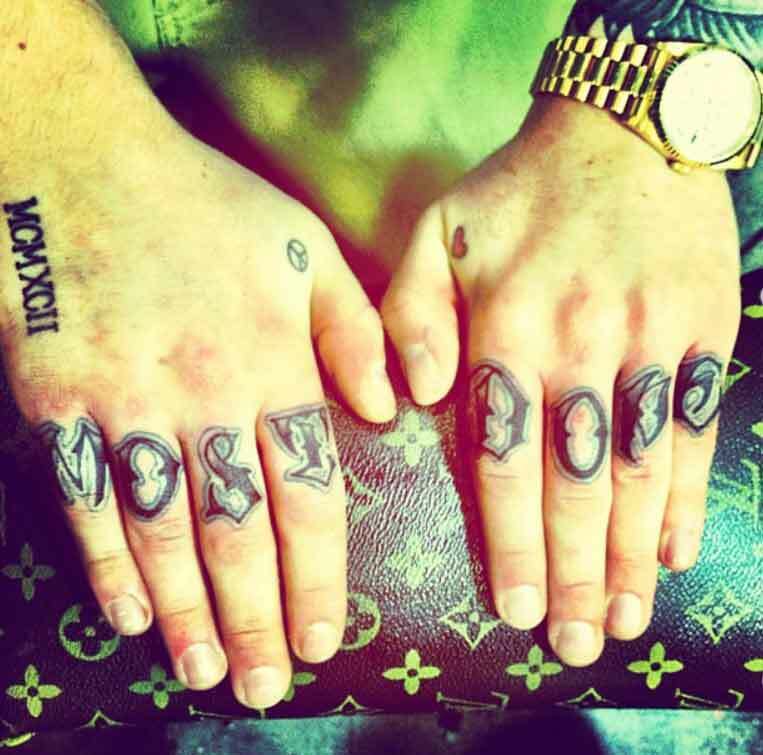 Miller got tattoos on his knuckles that read “MOST DOPE” which got him into trouble at the airport every time he used to fly to Cali. 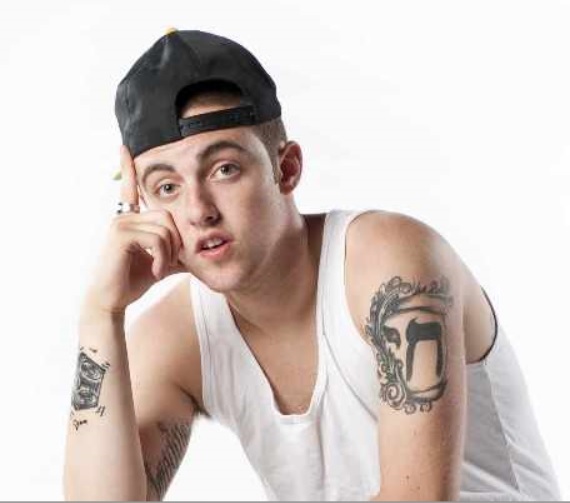 Miller had a Star of David tattoo on his middle finger (right had). And also a Cross tattoo on the other middle finger (left hand). 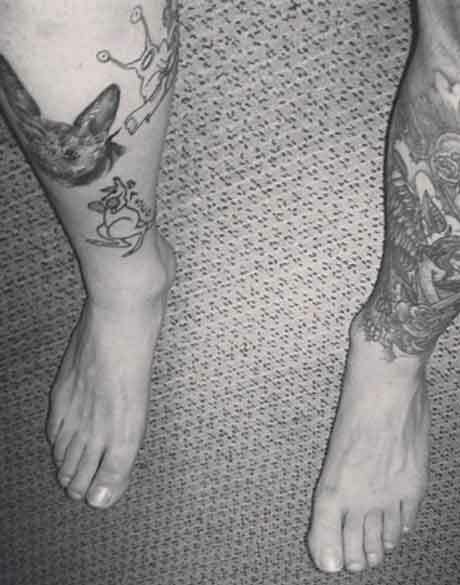 A kangaroo with boxing gloves says “BASED” tattoo on his right leg. 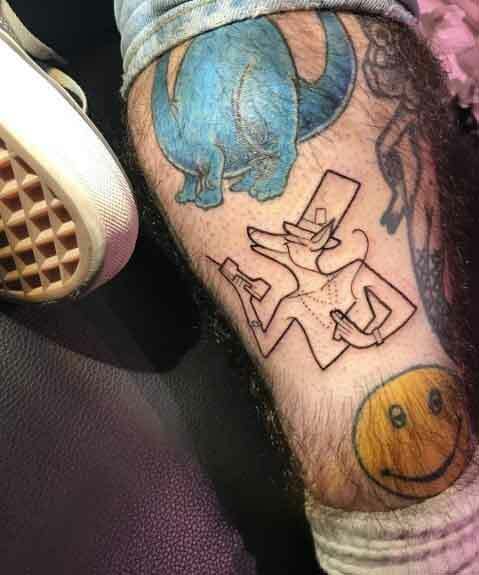 A big blue Brontosaurus and a yellow smiley face tattoo on the right calf. 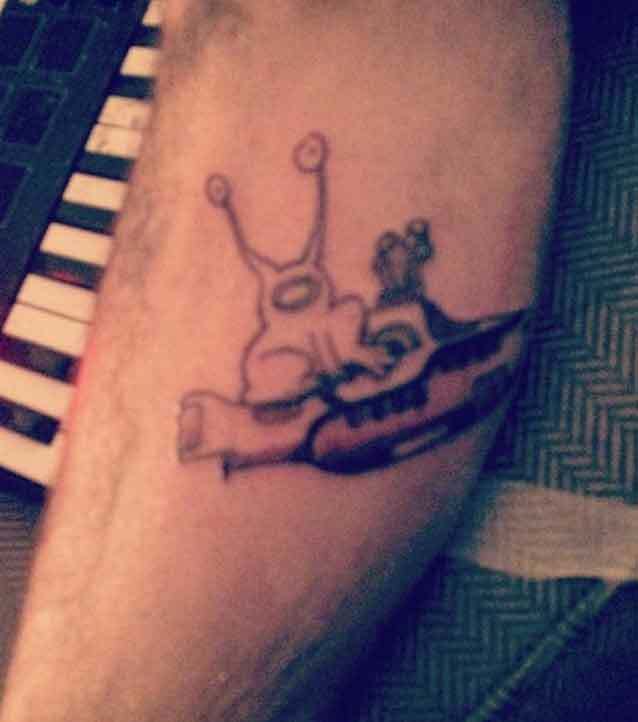 Alien from Daniel Johnston’s – ’Hi, how are you’ album riding Beatles’s yellow submarine tattoo on right leg. This was one of his favourite tattoos. In an interview Miller said that Beatles “Yellow Submarine” saved him from a bad acid trip. When he was freaking out from an acid trip; thinking the world is going to end and the god was going to come down, he put on Beatles’s yellow submarine and started laughing. He felt that the song was the truest description of this world. His left leg he had a tattoo of a heart capsule with flames coming out on the top and a fairy in the middle surrounded by roses. 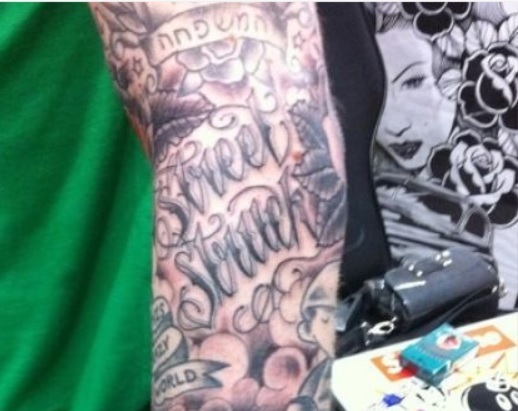 “street struck” tattoo on left forearm. 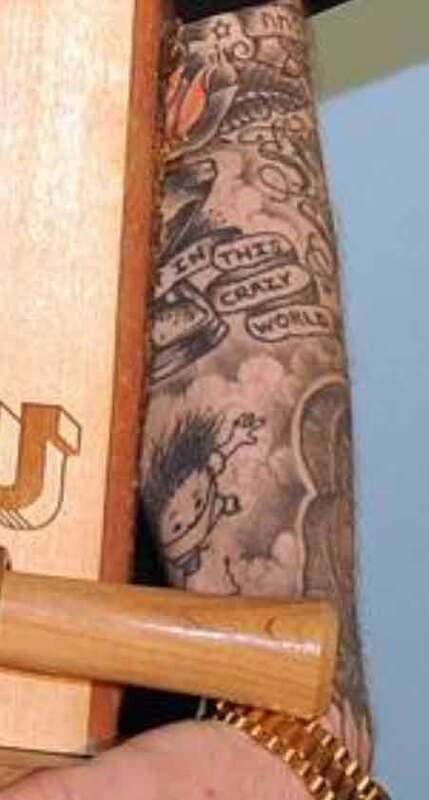 “in this crazy world” on a ribbon tattoo on left forearm. The Most Dope kid tattoo on left forearm. Rose tattoo on inner left forearm. Pin-up girl tattoo on inner left arm (in a Marilyn Monroe pose). Hebrew letter tattoo on left arm. A smiley face and thumbs up tattoo on inner left arm. ‘Imagine’ tattoo on inner right arm. One of his favourite John Lennon’s song. Albert Einstein’s face tattoo on right arm. 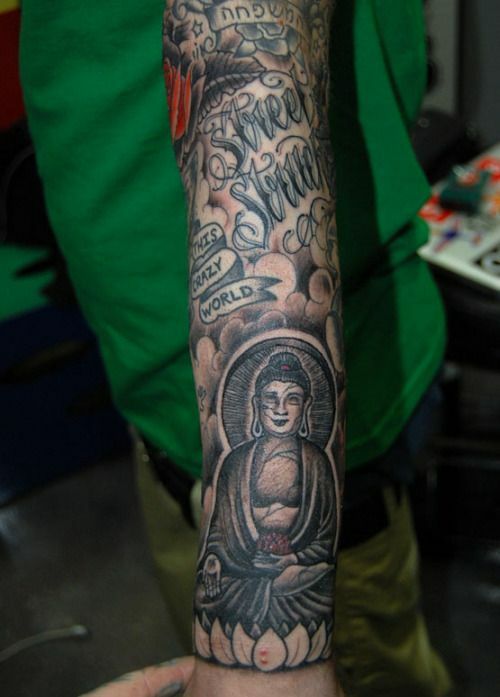 Miller had a Buddha tattoo on his left forearm. 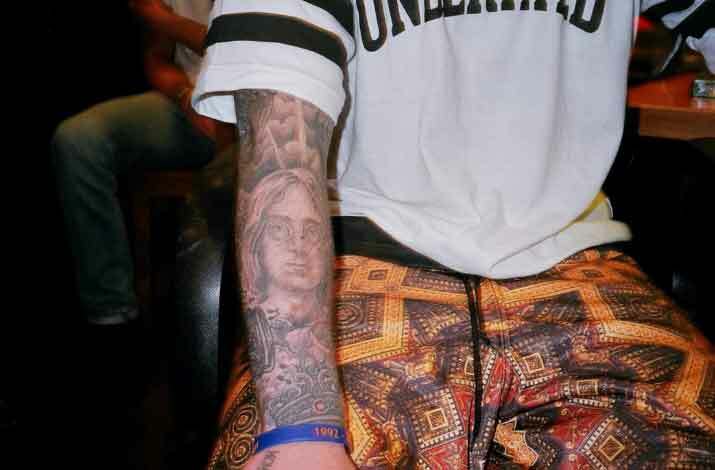 John Lennon’s face tattoo on right forearm. Miller grew up listening to The Beatles and he felt that he grew in music just like the Beatles. He loved John Lennon. Boombox tattoo on right forearm under John Lennon tattoo. 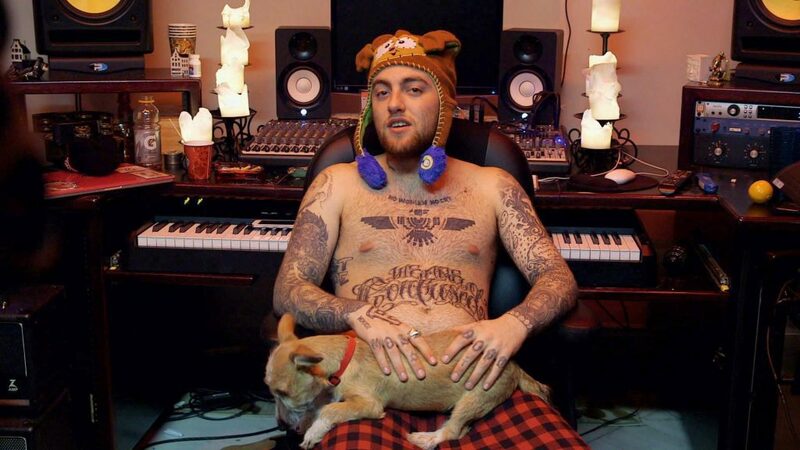 Ariana Grande got a tattoo on her foot says “Myron”, the name of the dog they (Miller and Ari) adopted in January 2017 when they were still dating. Ariana then adopted Myron after Miller’s death. 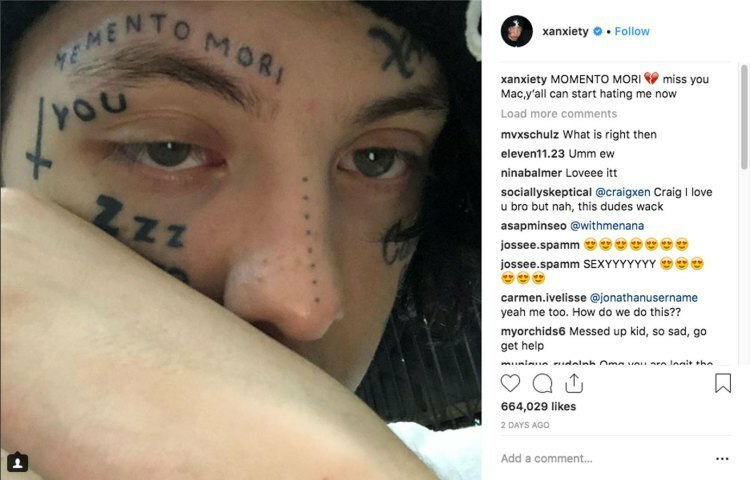 Rapper Lil Xan paid tribute to Mac Miller by getting a face tattoo that reads “MOMENTO MORI“. In Latin “Memento Mori” means “remember that you have to die”. 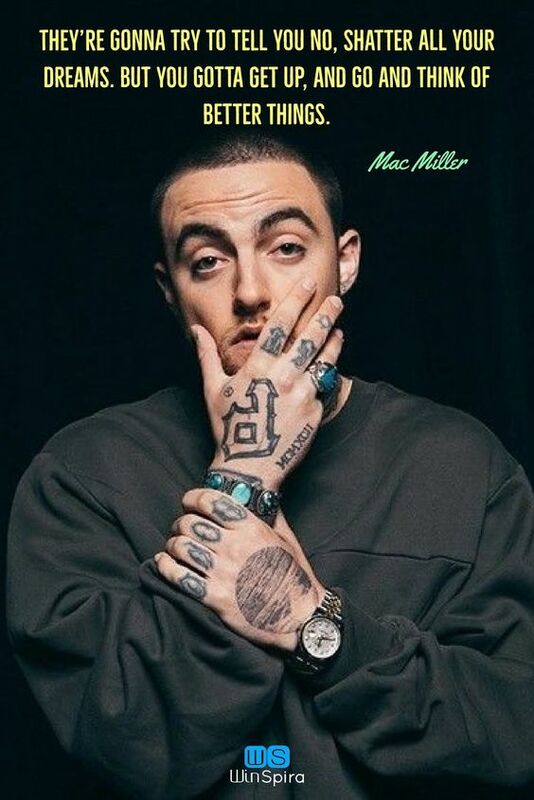 Lil Xan posted the picture of the tattoo on his Instagram with the caption “Miss you Mac, y’all can start hating me now“.